What can i say im a fake tan junkie, ive always hated using sunbeds i love to fake it! I have tried most of the brands out there....Lacome, Model Co. Airbrush Tanner, Body Shop, Boots.com and Superdrug, Benefit Jiffy Tan, Rimmel, Superdrug, Fake Bake, St Tropez, Johnsons Holiday Skin, Dove Summer Glow, Clinique, Piz buin, Au Courant, Garnier, Loreal, Ambre Solaire, Naturaglo, Mac Sundressing Spray ect. I could go on and on! I have used creams, gels, lotions, sprays, mouse, airbrushing, tan intensifiers - you name it ive tried it! Some work brilliantly, others are OK and somes are really bad! Im naturally paled skin but in the sun i do tan quite well. I admit i have used sunbeds in the past when i was younger but only a handful of times. To be honest i hated the whole experience...I didnt enjoy being locked in and was worried the whole time...3 mins seemed like an hour to me! But like everyone I think a tan makes you feel good, and look healthy. I also dont wear any makeup or bronzer when ive got a tan. Im always willing to try out a new fake tan - i think i may have a fake tan problem - well better that then using sunbeds or frying in the sun! 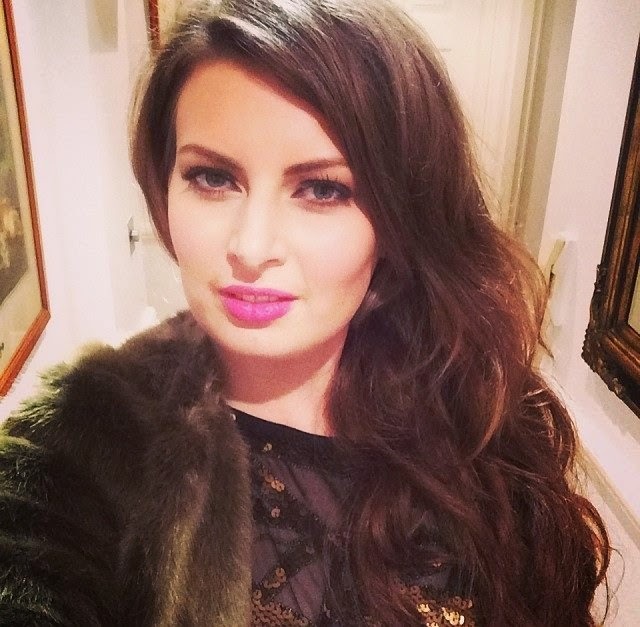 Gradual tanners are a good idea - but im impatient and like to see instant results! I shall do a review of my fav and not so favourite fake tans in another blog as my fake tan collection is rather huge!! I also have a few instant tanners which are brilliant for a quick fix if your in a hurry but terrible if it starts raining or if someone spills a drink on you its a nightmare and you end up streaky or white spots - not a good look! I also find that the instant tanners are really bad for staining underwear and clothes - the rimmel one is especially bad for staining my clothes red/pink and sometimes green!? To avoid those terrible bright orange hands from apply fake tan use a tanning mitt or gloves! I get my tanning mitts from either boots, superdrug, body shop or even M&S. I sometimes use latex gloves but i find these are better suited for cream fake tans rather than the mouse version as they tend to stick to the glove and make the tan streaky and patchy. I wouldnt recommend the st tropez tanning mitt, i have tried it and its good for applying the tan evenly however it is just made of terry towelling and the tan just soaks straight through onto your hands! If you do use the st tropez mitt then its best to put on a latex glove underneath the glove. You can also use sponges! I sometimes use a facial sponge or cloth, cotton pad to apply fake tan to my face as its more hygenic than using the tanning mitt. The worst thing for orange palms is the Rimmel instant tanner it really does stain them - but toothpaste is a good product to use to try and tame down the orange tone. I even wash my mitts in the washing machine! 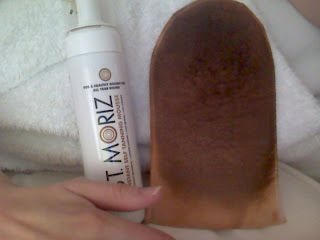 So when i heard about people raving about St Moriz i had to try it! People have said it is a copy of the St Tropez tan. I applied it last week late one night so i was tired and i hadnt exfoliated or mositurised and i have to admit i didnt apply it as well as i normally would - however it did not go streaky! I found the forumulation really easy to work with, it seems to just glide on! I noticed the colour is gold/brown not a sight of orange tone in the brown at all. St Motriz gave me a natural looking tan - an even and streak free finish. I like to apply the fake tan at night and leave it on overnight to develop. A few things to note - the smell is initially musky and pleasant and very similar to st tropez then by morning becomes the "biscuit" smell. It didn't stain my clean sheets at all. It gave me a natural looking light golden colour - i usually prefer a darker tan so i would apply this every night until i was happy with the shade then top it up every 3-4 days or so. The most annoying thing about any fake tan i use is it always wears off patchy and it takes some scrubbing to get off! Has anyone else tried this? Or have any tanning tips? Ive used St Moriz for a couple of years now and is certainly better than others such as Fake Bake and St Tropez (which I used to buy). A lot cheap aswell, usually about £3 a bottle from most places.